Higher education classrooms are increasingly diverse in regards to student culture, including race, gender, nationality, and intersecting identities. Yet, faculty oftentimes do not have adequate training in teaching, cultural competence, or intercultural communication. 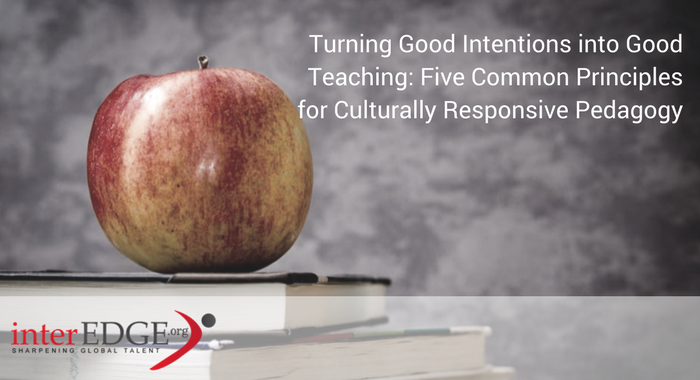 The co-authored chapter, Turning Good Intentions into Good Teaching: Five Common Principles for Culturally Responsive Pedagogy, goes beyond inclusive intentions and focuses on pedagogy that is truly responsive to diverse groups of students. Epistemology is “how we know the world around us or what makes a claim about it true” (Neuman, 2011, p. 93). An awareness of epistemology reflects an instructors’ ways of knowing influence pedagogy, teaching disposition, learning objectives, and the way instructors view their students. Culturally responsive faculty can exemplify an awareness of their epistemology by publically acknowledging their intersecting identities to students. In addition, instructors are expected to teach based on the commitment that there are multiple ways of knowing and multiple levels of reality. In particular, a critical epistemology, which unveils the “why and how” of sociopolitical phenomena, addresses hidden and visible power dynamics within classrooms that informs pedagogy and curriculum development. Any knowledge system has its own internal consistency and epistemologies. A responsive pedagogical approach should acknowledge the heritage of international and indigenous people as complete knowledge systems. A truly inclusive curriculum must acknowledge and build on the resources represented by students from different knowledge systems (Tange & Kastber, 2013). Faculty can exemplify this in a variety of ways, including assigning texts by authors that reflect the cultural groups of students, evaluating student learning using multiple modes of assessments (i.e. Tests, essays, discussion questions, group work), and validating student’s knowledge systems (informed by their cultural background) verbally. Another pedagogical approach is promotion of a comparative or collaborative approach, like sharing in groups; all students have equal opportunities to contribute. Inquiry-based instruction values the process of learning, as opposed to the content taught (Aulls et al, 2015; Capps & Crawford, 2013). It is an important principle because it helps students develop critical thinking and problem solving skills. This is especially true in the STEM field, since knowledge in this field is highly specialized and can be elusive for many students. Moreover, inquiry-based instruction is a fundamental tool for higher education faculty to advance gender equity. If faculty members engage students in an exploration of an academic question or query, rather than simply telling answers, they will engage in more robust learning. Also, Instructors can implement culturally responsive pedagogical practice in laboratory settings via inquiry-based learning, and students should be rewarded for thinking the process and having a rationale for their actions. This principle is useful in STEM classrooms as well as non-STEM courses, as it allows students to engage in higher level thinking and participate in significant learning experiences (Fink, 2013; Marginson et al., 2013). Student choice is not simply students making decisions, but rather encompassing their input, allowing students to take responsibility and buy into the processes and outcomes of their learning. By incorporating student choice, instructors are better situated to motivate the diversity and intersectionality of identities, interests and backgrounds of students. Because choice helps direct motivation, instructors should take steps to try and help students personalize and value their learning and create opportunities for students to make connections between course materials and activities and their own lives. In addition, offering students choice in the ways they represent learning provides students with a sense of control over the work. Culturally responsive pedagogy is transparent, involving continual ongoing assessment for the purpose of improvement, rather than only for evaluation. This kind of practice involves multiple low-stake assignments offered in a variety of formats, allowing students to demonstrate learning over time, with continual feedback. Yet the way the instructor delivers feedback can impact learning. For example, underrepresented students can be more motivated when they perceived an instructor’s feedback is delivered with a genuine desire to help them succeed, overcoming a historic lack of trust (Yeager, 2014). Formative assessment not only increases learning, but provides feedback to the instructor about her own beliefs and attitudes towards teaching, which echoes our first principle of epistemology awareness. With inclusive pedagogy at the forefront of an instructors’ day-to-day experience, theory can turn into pedagogical practice to tackle educational inequities. The interconnected teaching principles discussed in the article are meant to help instructors develop a reflexivity that lends to both the validation and the inclusion of diverse knowledge systems, student choice, inquiry-based learning, and formative assessment within a classroom. Marginson, S., Tytler, R., Freeman, B., & Roberts, K. (2013). STEM: country comparisons: international comparisons of science, technology, engineering and mathematics (STEM) education. Final report. Australian Council of Learned Academies. Neuman, W. L. (2011). The meanings of methodology in social research methods (7th ed.). Allyn Bacon. Meseret Hailu is a Ph.D. candidate in the Morgridge College of Education at the University of Denver and a Fullbright-Hays Doctoral Dissertation Research Abroad (DDRA) Fellow. Janiece Mackey is a Ph.D. candidate in the Morgridge College of Education at the University of Denver and co-founder of Young Aspiring Americans for Social and Political Activism (YAASPA). Joy Pan is Program Coordinator at International Exchange Office, School of Management, Fudan University in China. She earned her M.A. in international and intercultural communication from University of Denver. Dr. Bridget Arend is Director of University Teaching in the Office of Teaching and Learning at the University of Denver. She has a PhD in Education from University of Denver. Next International Students: Are you Dreading Class Participation?